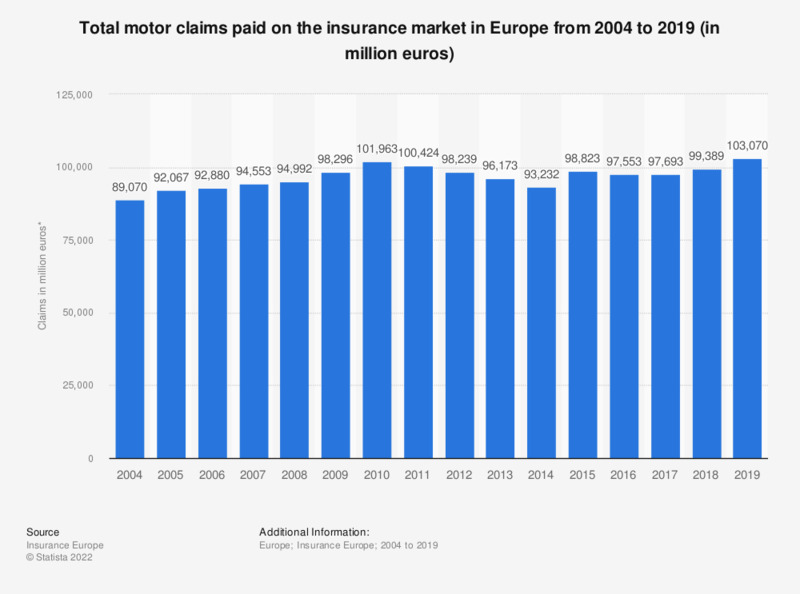 The statistic displays the aggregate value of motor claims paid on the European insurance markets from 2004 to 2016. The total worth of motor insurance claims paid out by the insurance providers in Europe amounted to over 103.5 billion euros in 2016. The European market includes: Austria, Belgium, Bulgaria, Switzerland, Cyprus, Czech Republic, Germany, Denmark, Estonia, Spain, Finland, France, United Kingdom, Greece, Croatia, Hungary, Ireland, Iceland, Italy, Latvia, Luxembourg, Malta, Netherlands, Norway, Poland, Portugal, Romania, Sweden, Slovenia, Slovakia, Turkey.